JMP Australia provide a range of stretch wrappers which help to secure loads to pallets through the use of plastic film. 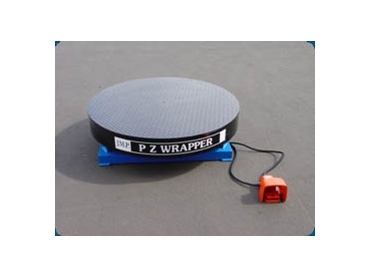 The P50 turntable stretch wrapper is the simplest wrapper in JMP Australia's stretch wrapper range. As a turntable wrapper, a load is wrapped by being placed on a turntable which then spins the load at speeds relative to the film roll. The product is then spun and wrapped with plastic film until it is fully secured to the pallet.